Still standing in the southeast corner of the Mesilla plaza is the courthouse and jail where Billy the Kid was tried and sentenced to death by hanging. The only authentic picture of Billy. 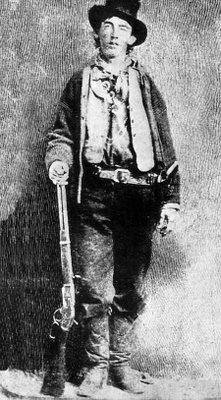 Billy had been captured December 23, 1880. On March 28, 1881, he was transported to Rincon by train and from there to Mesilla by wagon for trial for the murders of Andrew “Buckshot” Roberts and Sheriff William Brady. The indictment for killing Roberts was a federal indictment. The indictment for killing Brady was a territorial indictment. The territorial district court handled both jurisdictions, with the federal cases tried first. His trial for killing “Buckshot” Roberts began on March 30, 1881. The case against him in this trial was thrown-out on the grounds that the killing took place on private land, not public land, and the federal government thus had no standing to prosecute. The trial for the killing of Sheriff Brady began April 8. The judge presiding, Judge Bristol, dismissed Billy’s defense attorney from the Roberts trial, probably because of the change in jurisdiction, and appointed John D. Bail and Albert Fountain to represent him. On April 13. the jury brought in its verdict: guilty. The judge then sentenced Billy to death by hanging, to be carried out on May 13, 1881 in Lincoln, New Mexico. Three days later he was taken to Lincoln. It was from the Lincoln courthouse that Billy escaped on April 28, killing two deputies.